The German government is planning a new military mission in Libya, Defence Minister Ursula Von der Leyen (Christian Democrats, CDU) announced in an interview published by the tabloid Bild on Monday. In the meantime, Libya’s various competing governments have agreed on the formation of a unity regime under the auspices of the United Nations. 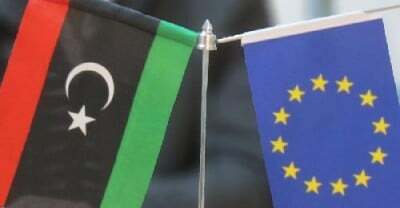 This was announced by the Libyan presidential council on Tuesday. A major role in the talks was played by the UN special representative for Libya, Martin Kobler. He is a German and headed the office of former Green Party foreign minister Joschka Fischer. Kobler welcomed the formation of the unity cabinet and called upon the internationally recognised parliament in Tobruk to “quickly” recognise the government. From the standpoint of the imperialist powers, the new government is to supply a “legal” fig leaf for their intervention in Libya as quickly as possible. Who is guilty of confusing cause and effect? Everyone who knows the dramatic history of the Middle East over recent years knows that the original “terrorism” was carried out by the Western powers. They are not fighting for “freedom,” but have rather under US leadership attacked and destroyed Afghanistan, Iraq, Libya and Syria, killing millions and turning millions more into refugees. Islamic State is not simply an indirect product of Western military policy, but was rather built up by the imperialist powers and their allies Saudi Arabia, Qatar and Turkey. In the NATO-led war on Libya in 2011, the Western powers worked closely with Islamist militias to overthrow the regime of Colonel Gaddafi. The plan was to bring the Syrian government of Bashar al-Assad down in Syria in the same way, with the goal of establishing a pro-Western puppet regime in Damascus. In reality, the military intervention that Germany now threatens to carry out in Libya has long been in the works. The talk of a struggle against an “axis of terrorism” from Syria to Mali (Von der Leyen) is simply the propaganda smokescreen behind which the long-discussed plans are being implemented in practice. Following the 2011 bombardment of Libya, the German ruling elite became convinced that its failure to participate was a grave mistake and that its “short to medium term interests” had to be enforced via military means. The Middle East and north Africa were identified as an important area of German influence, which had to be stabilised militarily. “A pragmatic German security policy, particularly when costly and long-term military interventions are considered” had “to concentrate above all on the increasingly unstable European surrounding from north Africa through the Middle East to Central Asia,” the paper stated. Based on this paper, German President Gauck, Foreign Minister Steinmeier and Defence Minister Von der Leyen officially announced the “end of military restraint” at the 2014 Munich Security Conference. Germany was “too big only to comment on world politics from the sidelines” and had “to be prepared to intervene earlier, more decisively and substantially in foreign and security policy,” they declared.